This example shows how to use Google Tag Manager variables with a Sailthru userSignUp call to capture the values of a form used for user signups. In the example, we use Google Tag Manager to listen for events on a button click and submit the form using an AJAX request in jQuery. Include the following code on your site. Notice that the id attributes will match variables in Google Tag Manager that will get the value of the associated form field. Google Tag Manager allows you to set one or more variables which you can use in a tag. This is a useful way of capturing the value of a form field when using an AJAX form, like our example above. Below, we will create variables to capture the email, first name, and last name submitted in the form. In Google Tag Manager select Variables from the navigation menu in your workspace. Under User Defined Variables, click New. 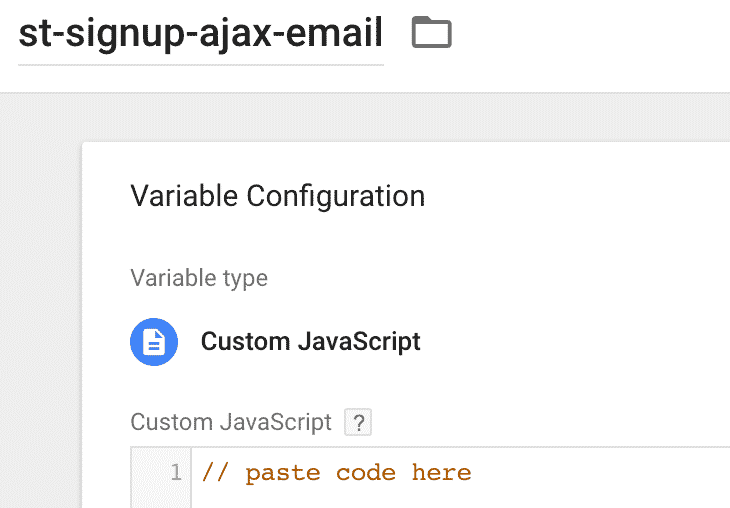 At the top-left, rename the variable to st-signup-ajax-email. Paste the following code, which will allow us to select the email value from the form field. This code first sets a variable called form to select the form you are working with. You’ll notice in the HTML form in the previous section has an id of sailthru-form-ajax. This id is used here to select the form. Repeat this process and create two new custom variables to match your field IDs for first name and last name. Copy and paste the following code into another new custom variable saved as st-signup-ajax-first-name. Copy and paste the following code into another new custom variable and save it as st-signup-ajax-last-name. In this example, to make the variables easy for us to identify in the tag manager interface, we have named the variables using the same name as the id that we used when we saved them. When you create your own code in production, you can use names that make sense to your team. In Google Tag Manager, click New Tag, then change the tag’s name from “Untitled Tag” to “Sailthru – userSignUp”. Copy the code sample below and paste it into the HTML box. Scroll down below the HTML field and click within the Triggering box to add a new trigger, so that Google Tag Manager knows when to fire the tag. At the top-right, click to add a new trigger. Click the Trigger Configuration box, then select the trigger type All Elements. Remember those IDs that you set on the HTML elements? Now’s the time to use the button and its ID to trigger the firing of the tag. We will instruct Google Tag Manager to listen for any click events that happen on a HTML element with an id of sailthru-signup-ajax (your form button). Under This trigger fires on, select Some Clicks. Select the options Click ID and contains, and enter the ID sailthru-signup-ajax in the last field. You can optionally give your new trigger a name in the top-left corner. That’s it. You should now see your new users in your Sailthru account when they complete your signup form!